In wildfire situations, most homes are not destroyed by the initial fire front of the wildfire but by the embers from that fire. 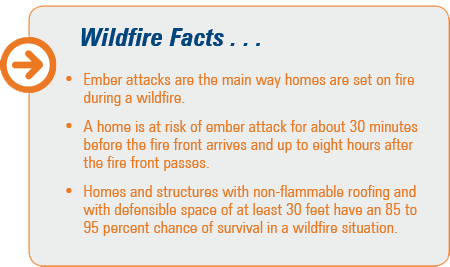 Creating defensible space around your home and regular clean-up of vegetation and flammable materials will lessen the opportunity for those embers to cause another fire. Use fire-resistant materials when possible (especially on the roof of your home). Create a safety zone around your home by clearing leaves, dead limbs, and other flammable vegetation. If you live in a community at risk of wildfire, FEMA recommends creating a 30- to 100-foot zone around your home. Remove leaves and debris from roof, gutters, vents, and under structures. Safely store flammable items such as gasoline and oily rags in approved safety cans and away from your home or other structures. Keep a garden hose within easy access. It should be long enough to reach any area of your home and all structures on your property. Prune trees and bushes regularly to keep them clear of power lines and chimney outlets. Remove dead branches that extend over the roof. For more suggestions on protecting your home, visit www.fema.gov. Misconception: My home is not located in a flood zone, so floods are not a risk and I don’t need flood insurance. Even if your home is not located in a high-hazard flood zone, you are still at risk. Hurricanes, winter storms, and snow melt are common and often overlooked causes of flooding. New land development can increase flood risk, especially if the construction changes natural runoff paths. Nearly 25 percent of all flood claims come from moderate to low flood risk areas. Though you may not be required to hold flood coverage based on your geographic location, this is still important coverage to add to your policy. Remember, standard homeowners and renters insurance policies do not cover flood damage, so you will need to discuss this coverage with your agent in order to add it to your policy. Misconception: The value of my home has declined with recent market fluctuations, so I should be able to lower my insurance coverage to save money. The value of your insurance policy should be based on the cost to rebuild your home rather than the market or tax value of your home. The purpose of the homeowners policy is to rebuild your home and replace its contents in the event of a total loss, so the policy value should be based on actual rebuilding and replacement costs rather than perceived market value. How do you determine how much coverage you need? Your insurance agent has access to tools that will help estimate the rebuilding costs of your home. Your help in maintaining an accurate home inventory will aid in ensuring your policy is adequate for your needs. Misconception: I added my boat to my homeowners policy - I don’t need any other coverage to protect this asset and my liability.